This is an unlimited data SIM card in South Korea that will get you online for 1, 5, 10, or 30 days. Get yours here for a discounted price. If you'll travel solo, get an unlimited data SIM card in South Korea. It'll save you from your fear of missing out. The 4G LTE KT Olleh SIM card can offer fast, unlimited, and strong connection for 1, 5, 10, or 30 days. Check the rates and discount for the KT Olleh SIM card for Korea here. Pick-up and set-up will be a breeze. Expect the connection to blow your mind. Alternatively, if you’re traveling from Hong Kong, Thailand, or Malaysia, you may also get a roaming SIM card prior to your Korea trip in their respective airports. If you have installed a Korea data SIM card on your phone before, there's a special instruction for you in the TIPS! section below. Why get a data SIM card in Korea? Sure, there will be lots of public hotspots and Wifi-enabled cafes in South Korea. Your hotel or AirBNB host would also provide you internet access. But most of your time will be spent outdoors, googling your way to the next destination, and sharing about your experiences on social media. For these reasons alone, it's wise to invest in a Korea SIM card for apps like your browser, Facebook, Instagram, Google, Waze, or what have you. With a data SIM card in Korea, you will also be able to make online calls and texts through social apps like WhatsApp, Kakao, Messenger, and Viber. There's no need to buy a prepaid SIM plan that includes voice and text messaging, unless you'd need to make outgoing calls to a local/international number. Why get the KT Olleh Data SIM card in Korea? Unboxing at Incheon Airport. Kind of. The KT Olleh SIM card also offers a very strong and reliable internet connection. Unlike some users who reported a decrease in speed after the third day of their data usage, my experience with KT Olleh was smooth all throughout. Fortunately, I did not notice any lags even after using it for work and leisure for seven (7) days. However, if there's one thing that I wish this unlimited SIM card in Korea would offer, that would be a plan for 15 days. Some travelers do spend around 2 weeks in South Korea, so having this option would be more preferable than the 30-day KT Olleh Korea SIM card package. Open the listing for the KT Olleh SIM card here. If you don't have an account with Klook yet, you may sign up using my referral link here to get an instant discount for this booking. Select the number of days that you’d want unlimited data in Korea for. Choose between 1, 5, 10, and 30 days (Data Only). Choose the date of pick-up and quantity. Enter your passport details and select your pick-up location. Pay for your KT Olleh SIM card in Korea via PayPal, Visa or Mastercard (prepaid, debit, or credit), or cash. The KT Olleh SIM card kit that you will receive will come with an instruction manual. It'll say that you're supposed to restart your phone and wait for a few minutes before it gathers the signal. In my experience, I only had to restart my phone once and waited roughly around 3 minutes. Alternatively, you can purchase an unlimited data SIM card in Korea without ordering online. Just walk up to any bookstore, convenience store, or any of the KT Olleh Roaming centers listed above. The only downside of not buying from Klook is that you will have to fill out an application form (hassle!) and you'll miss out on the discount, which is usually around ₱130 or $2.5. Verify if your phone is unlocked and compatible with the KT Olleh SIM card. If it isn't, visit your carrier store or a phone repair stall. 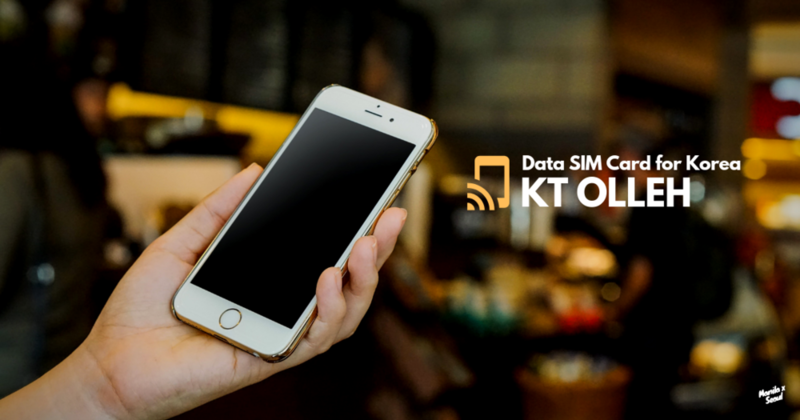 To verify if your phone is compatible with a KT Olleh data SIM, check out the product listing from the link provided above or click here for a third-party SIM checker. There's a pin at the pick-up counter that you can use to eject your phone's SIM card drawer. Your KT Olleh data SIM card in Korea must be activated on the redemption date. The day count starts when you redeem it, not when you actually use it (e.g. the next day). With a SIM card in Korea, you can also use your phone as a mobile hotspot to connect all your other devices. I was able to connect my laptop and tablet seamlessly. After use, you may bring your SIM card back to your home country as a souvenir. There's no need to return. If you have used any Korean SIM card on the same phone previously, dial *#06# and take note of the numbers that will show. You will need this when you order and get your SIM over the counter when you arrive at the airport. Do not book online! If you booked this activity but have previously used a SIM card in Korea for the same phone, you may not be able to activate the card. If you fail to activate the card at the counter, please contact Klook to get a full refund. To know more about this SIM card in South Korea, you can visit KT's website here. Like ManilaxSeoul on Facebook to keep up with the latest promos and Korea SIM card deals!